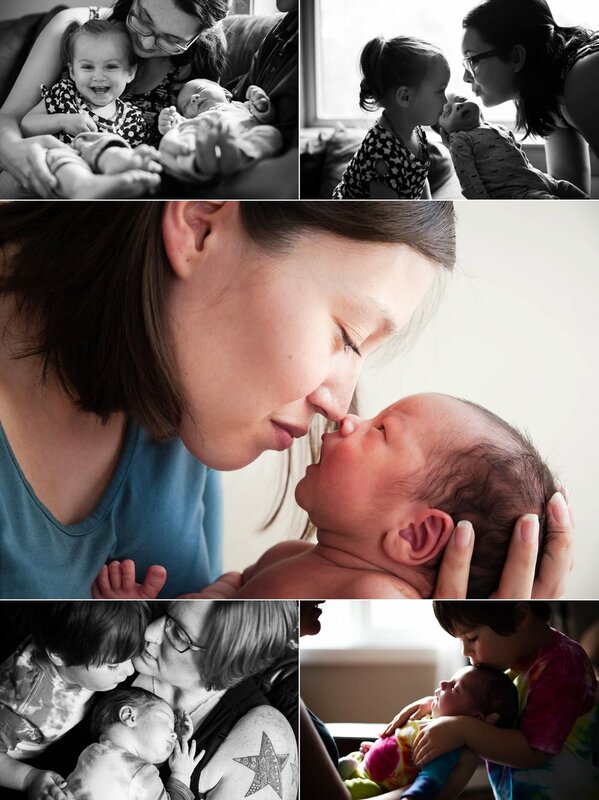 Non-traditional family portraits: recent favorites. Perhaps my favorite part of custom family sessions is the process of creating at least one non-traditional family portrait. It's kind of like solving a riddle: how do I (somewhat organically) get everyone into the frame? And once I get them there, how do I portray the family authentically, as more than a sum of its parts - preserving at least a hint of the laughter, energy, noise, and personality uniquely inherent to every group. I love a good traditional image, too - everyone smiling at the camera. I call it the "Christmas Card Picture." I will admit, even I usually end up putting one of those on my personal holiday card, so great-grandmas and far-off cousins alike get to really see how big the kids are, etc. But for a canvas in my home? Personally, one of these is what I'd want printed huge on my wall. What about you? What do you have on your walls? I'm having a rare, very picturesque holiday moment right now. 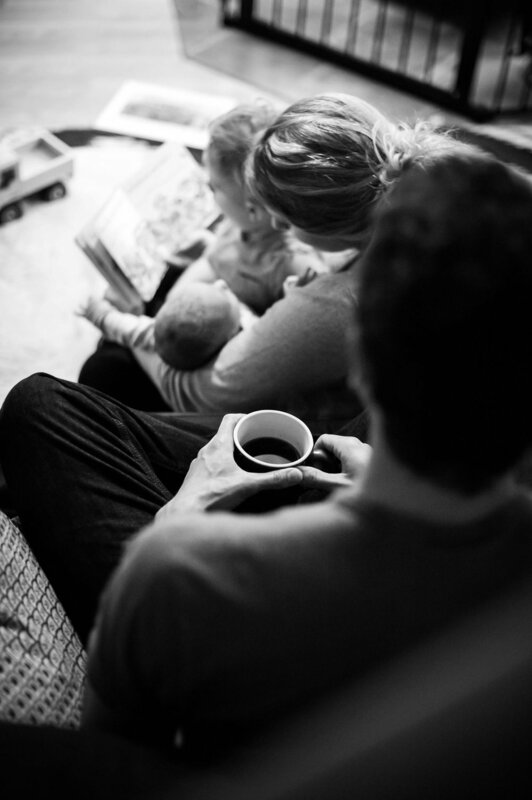 The house is toasty with the glow of the woodstove and delicious smells waft by; the turkey is brining; the baby is napping; and the big kids are relaxing with daddy. Sure, the floor is filthy and a million other things that need to be tidied are calling my name...but this moment is too delicious not to lean into it a little. A picturesque holiday moment, and perhaps also a stereotypical one, as I've been reflecting on the theme of being thankful. *Cue sentimental music* Seriously, though, too often we're prompted to consider thankfulness only through the lens of loss - only in comparison to the misfortune, tragedy, loss, grief, and trials of the rest of the world. Kind of like how I only remember how extremely grateful I am for good health when I've narrowly avoided a brush with influenza, or how we may pause to remember how lucky we are to have a home to keep us warm and safe only after listing to stories of home fires and homelessness on the news. Basically, it's the "eat your vegetables; there are starving children in India" vibe in a nutshell. Not that this a bad thing, necessarily. It's kind of unavoidable, and am empathic awareness of others and the global community is something to strive for in many ways. But the ever-presence of this lens came into focus recently as I've caught glimpses of a different kind of thankfulness. It's a pure sensation. It's elation and joy, and a momentary suspension of fear and trepidation. It is completely of the moment, and it's likely to cause goose bumps. I was invited to document a friend's redeployment ceremony earlier this month as he returned from a nine-month deployment to Afghanistan. This image, which I took moments after he was finally returned to his family's arms, is what first struck this Thankful chord. Alan's face. He is completely and totally present. He's not thinking about the last nine months or the next five minutes; he is completely in that moment. It's a strange kind of zen to find in the middle of a heart-wrenching event, but I think it makes it all the more remarkable. His face says it all. And so today I've been thinking about how fortunate I am to have access to these moments of pure thankfulness, even if only to document them. And I thought I'd share a couple of them here. UPDATE: Sold out for 2017! If you'd like to get on my mailing list so you can get advance notice for 2018's sessions, you can sign up on my Contact Me page. I can hardly believe it, but it's that time of year again! My last mini-sessions of 2017 are coming up this weekend, Sunday November 5. 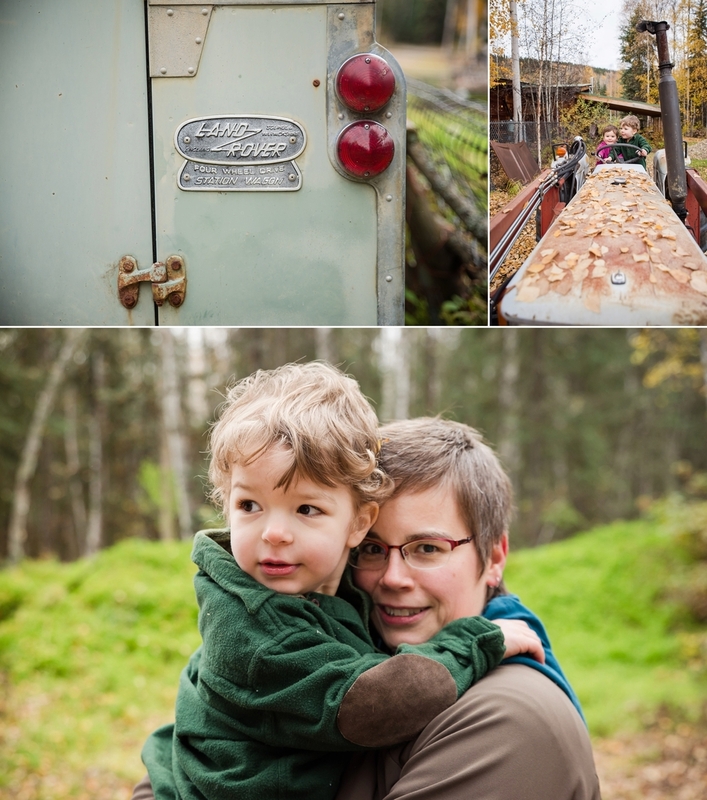 This will be the fourth year in a row Running Reindeer Ranch and I have collaborated to offer these unique, amazingly fun sessions done on location at the ranch in the Goldstream Valley. It can be a little chilly, but these sessions are short, sweet, and SO. MUCH. FUN. Watching kids light up at the sight of the reindeer ambling up to them never gets old! The inclusive fee of $150 covers your 15-minute session, 3 to 5 digital images, and a print release. Sessions will be held from 11 am - 5 pm on the hour, twenty after, and forty after. You can reserve your slot here! Here are just a few favorite images from the past few years' sessions. Just imagine one of these on your holiday card this year! UPDATE: July 8 Little Sessions are SOLD OUT! If you're interested in a make-up session, please contact me! The peonies are set to bloom in the next few weeks, and that means it's time for Little Sessions at Alaska Peony Flowers' farm in the Goldstream Valley! 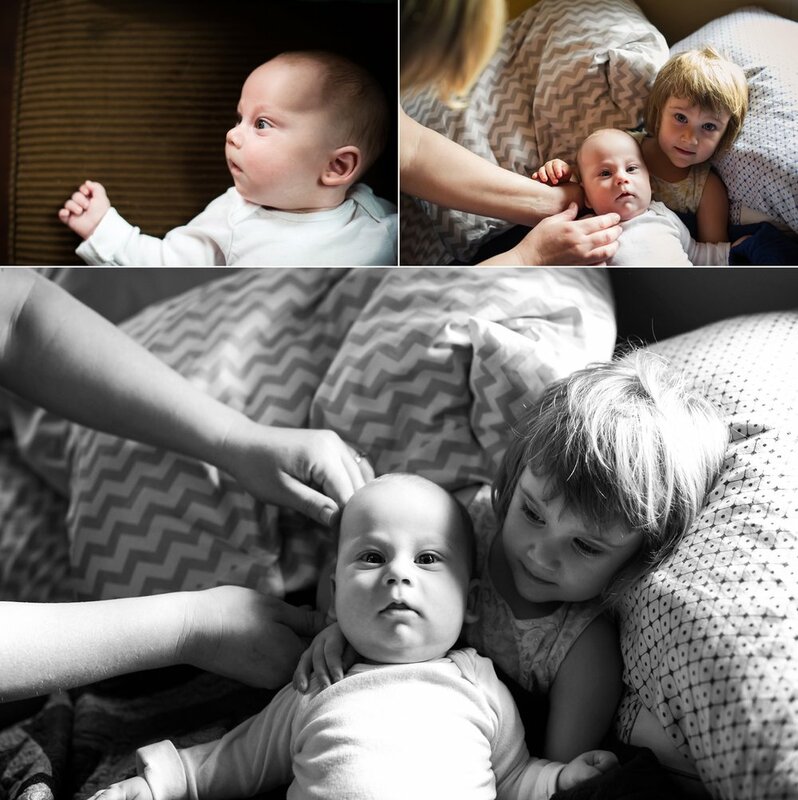 35-minute Little Sessions are a sweet spot between mini-sessions and full custom sessions, and are a great opportunity to grab some beautiful portraits. Couples, families, and individuals are welcome. The inclusive fee of $175 includes your session and a complete set of high resolution images via digital download. Sessions begin at 12:30 and will go into the 5 o'clock hour! Reserve your spot now. If there's a time you prefer, please leave me a note letting me know, and I would also love it if you would let me know how many people I can expect for your session (including the ages of any kiddos). This family. Not gonna lie, this whole session makes my heart sing a little! I was recently inspired to share a weeklong series of nontraditional family portraits over on my Facebook page, and I realized I should put them together here, too! These images are a scant few of my favorites - everyone in the frame, full of movement and connection. I love to craft and capture moments that, when snapped, belie much more than the sum of its parts; images that capture more than your face. They break the cookie-cutter mold in all the best ways imaginable. These might not be the images you would choose to put on your annual holiday card. You can't always see everyone's face; they're quirky and intimate. But each of these are images I would print on a canvas to hang on my wall. This motherhood gig, you guys. It's no joke. Case in point: I was saving this treasured session so that I could time its debut on the blog with the actual holiday season. And then, of course, it slipped my mind. I'm going to take the chance that some of you are up for extending the holiday spirit for just a little bit longer. Even though January has mostly passed us by at this point, allow me to transport us back to Christmas! This session is so incredibly special, and I can take no credit for it. It's Shilo's brainchild - when presented with the opportunity of the winter holidays and all of her children's grandparents in town, she realized what a moment in time it was - one that, as crazy as life is, may not be repeated for quite some time. And so she asked me to document it. 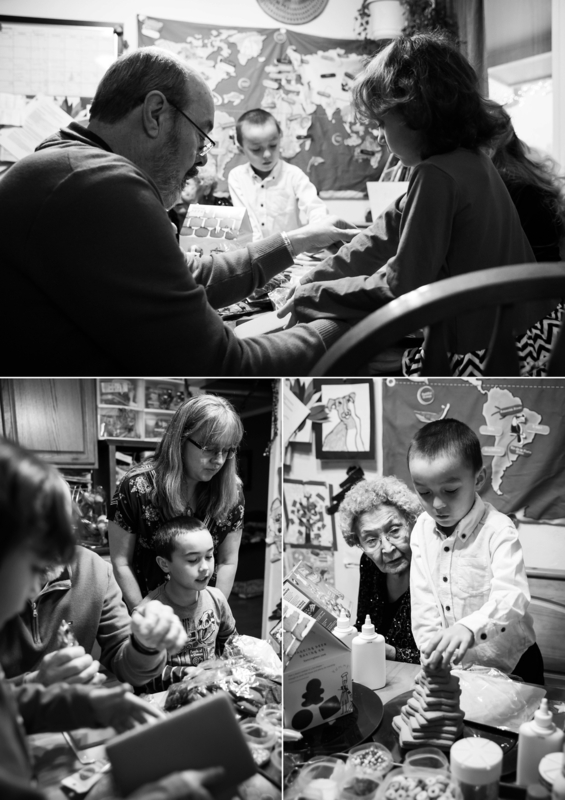 So here are Malachy, Rowan, and Rainey building gingerbread houses with their grandparents.